I'm back! I feel like I've started every post in the past two months with that thought, but that's only because I'm so damn busy, or on a worse note, so damn lazy. I can't help it. It's summer. But I blame this recent hiatus on the first excuse I gave because I was ~vacationing~. Well, if you also count college orientation as a vacation (which, in all honesty, felt like one. College is going to rock). But then I made my way from George Washington University in D.C. to L.A. to visit a friend (remember her from here and here?). This has been a week and a half of new endeavors, I suppose. From college orientation straight to a city I've never been to, it's been hectic. But hectic is good! My life will be hectic 24/7 in a few months, so I might as well start now. So Los Angeles. L.A. The city of angels, right? West coast, best coast? As a fellow East-coaster, California has been an enigma to me. I went once last summer, but they don't care what you do in San Francisco. Everything's different in L.A., I thought. And it was. Everything was so spread out and I've now decided that L.A. traffic should go on the top ten list of the worst things ever. Apart from having to sit in your Uber for 45 minutes just go get downtown, L.A. felt, well, strange. So I guess it can still fall in the enigma category for me, even after visiting it for five days. People cared. About looks, personal appearance, the clothes you put on your body. It was never direct, but whenever I walked past people who were probably models or L.A. fashion bloggers or just elitists, I felt a sense of discomfort, like I didn't belong. And how did I manage to deal with this? With a big middle finger to those who cared too much about my own personal decisions. Or in non-metaphoric terms, I wore what I wanted to wear. And had a damn good time. Top by Zara. Shorts by Gap (similar here). Scarf by Urban Outfitters. Sunglasses by Madewell. Shoes from a boutique in San Francisco (or try these). 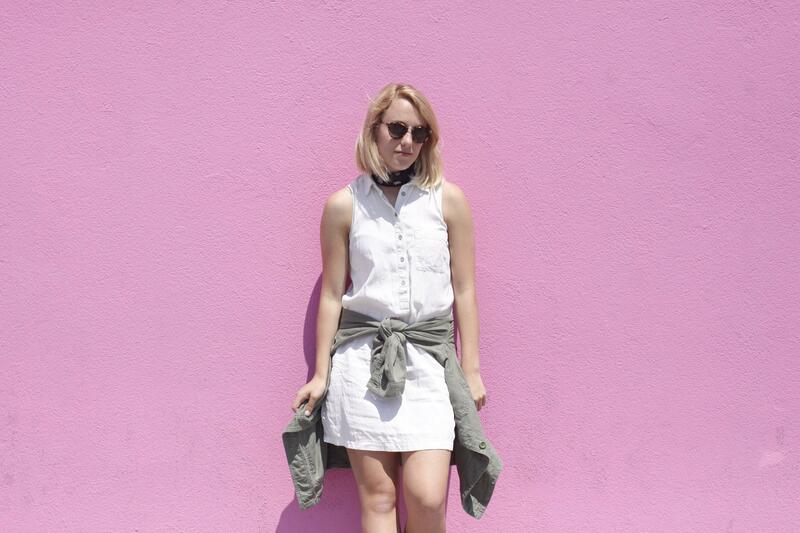 The style in L.A. is supposedly "effortlessly cool" with a ton of simple and a touch of trendy. The hypocrisy in all of this is it is not effortless. Only true L.A. girls can pull this off, which I immediately shook my head at and decided to do my own thing. In this scenario I wanted to go for a casual summer look with denim shorts but then I made those shorts très cool by pairing them with a going out top (did I do it right?) from Zara. 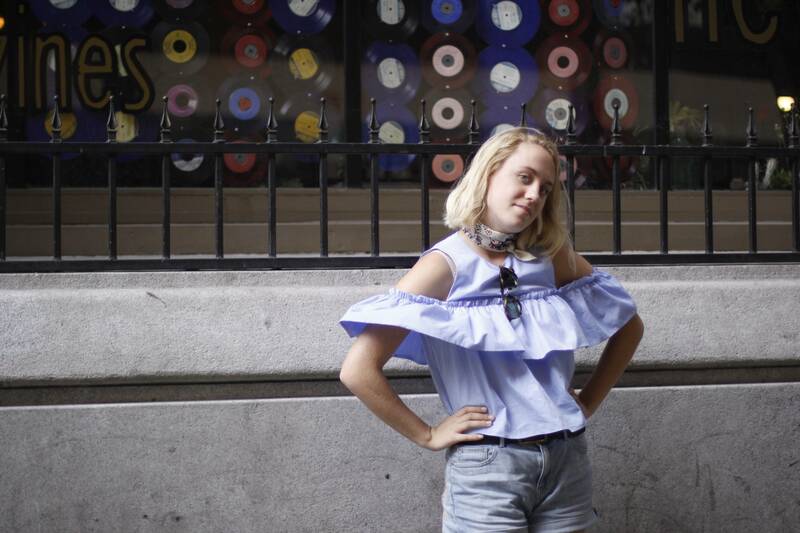 Off the shoulder tops are kind of dead but this one doesn't necessarily fall into that category. This top immediately eliminates the simple factor in the L.A. style, so I continued to add more: a neck scarf and a pair of sunglasses. Now that's how you do L.A. fashion. Dress by Urban Outfitters (or try another midi like this). Shoes by Adidas. Sunglasses by Madewell. Dress by Lou & Grey (or try this by Asos). Jacket by Topshop. Sunglasses by Madewell. Shoes by Adidas. 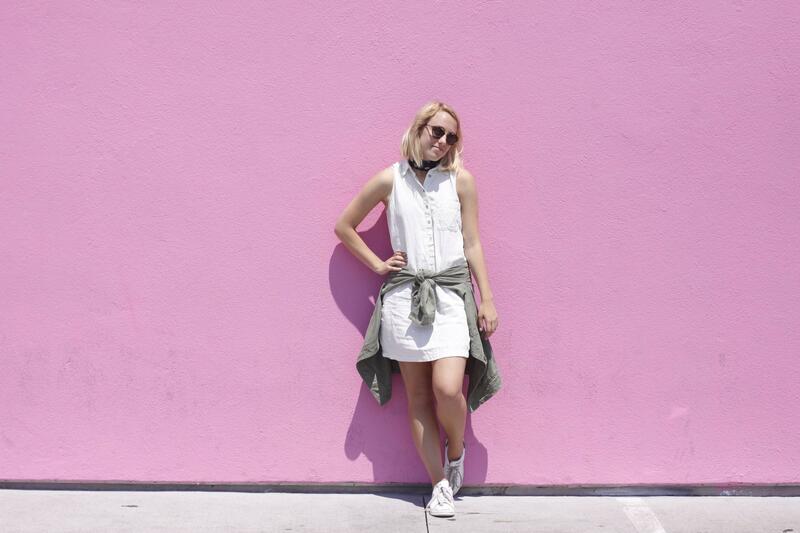 On my final day I accidentally was a little too L.A. -- a white dress with a bandana choker fit in a little too well with the looks of people strolling down Melrose Avenue (and posing in front of this pink wall). I added the jacket to make it my own, but then I realized the whole point of this fashion challenge was not to stray away from L.A. styles but to not change my own style to fit in with California standards. And maybe overlapping will occur (like it did here!). So I slid my sunglasses off, looked around at the well-dressed people, and recognized that maybe I was one of them. Or maybe I'm not meant for the West at all -- the East coast is better, anyway. First two photos taken by my sister, Kendall, and last two photos taken by my friend, Lauren. I've recently spent some time wondering why any of us even bother to care about fashion. It's just the clothes on our body. Our means of protecting ourselves from the elements, that's all. Why do we care so much if it's H&M or Zara or luxury brands like Gucci or Proenza Schouler? It's all the same, if you think about it. Like McDonalds fries vs. parmesan truffle fries. Drugstore lipstick vs. NARS velvet matte lipstick. Now do you see the difference? But I'm trying to dissolve that difference, blend the two together to where all fashion is simply fashion. Because at the end of the day, brands shouldn't fall into our list of worries. So if brands don't matter, why do we care? I could bring up the idea of following trends and how fashion brings us together in one loving community because we all desperately want to try that new slip dress trend, but then that brings us to the idea that we could all be, dare I say, fashion followers (*gasp*). So what does it come down to in the end? You guessed it. Personal style. 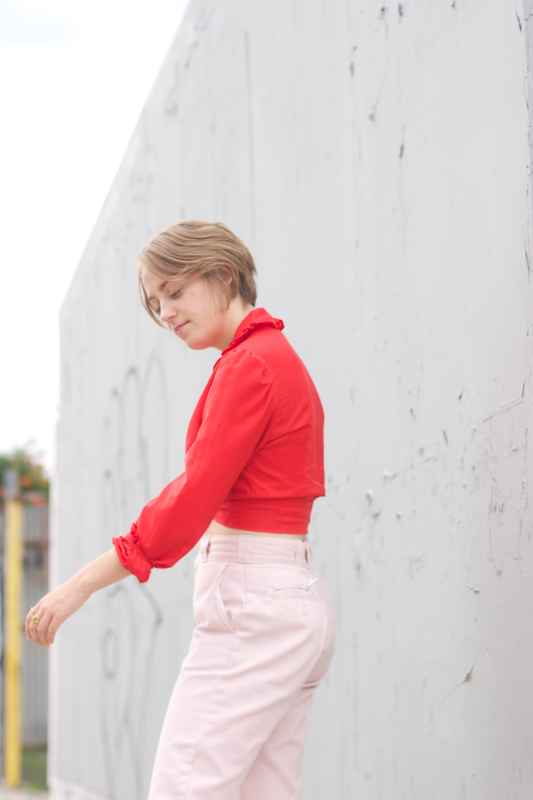 I started this blog solely because I wanted to praise personal style, but now it seems like every blogger and fashion-lover and person who does not reside in a cave is talking about it, which makes me extremely happy. Personal style is the reason I'm here in the first place. What is it, anyways? Well, it's how we personally like to style ourselves. Duh. In more detail, personal style is about self expression, wearing the clothes that we feel ourselves in, and most importantly, making our own ~individualistic~ statement with how we wear our clothes. A good observation to take from all of this is that it's not the what we wear, it's the how we wear them. It has sadly become a lost art because we forget about our own personal fashion desires and start claiming other people's (whether they're fashion icons or even men). I say it's time put an end to this and wear what we want, fashion rules and patriarchy be damned. Luckily, we're in an era where personal style is so important because individualism and staying true to ourselves is a new, hip thing. And even better news is this: Bloglovin' and H&M are partnering to find the "Breakthrough Fashion Blogger of the Year." Okay, so how is this relevant to personal style? Jeweled shirt by J. Crew (or try something like this). Tank by Urban Outfitters. Skirt by H&M (an updated version here, or try this one from Asos). Clogs by Anthropologie. Neck scarf used as a wrist accessory by Urban Outfitters. When I first heard about this opportunity a month ago, I ran to my closet, searching for my favorite H&M item that happened to be a metallic pleated midi. I haven't worn the piece since I had long hair and wore too much eyeliner, and now I'm thankful for this contest to force myself to wear it again and also realize that the zipper was missing. And what a time to wear a pleated midi! Suno loves them, Gucci really loves them, but most importantly, I love them. So I mentally checked off the "personal style" note in my brain, fixed the zipper, and spent some time thinking about this outfit. And some time means a month, literally. At the end of the month, I realized that personal style shouldn't take a month to plan because it should be the embodiment of me. Like my own skin. But another aspect of personal style is stepping outside your little fashion box so we can explore what makes us grow, in the style sense. With these ideas in mind, I tried some reverse layering -- a cropped tank over a t-shirt, specifically this jeweled one from J. Crew under a rust tank from Urban Outfitters that is reserved for music festivals or California when worn alone. My instinct would have been to wear my Stan Smiths but I feel like those don't follow my personal style route anymore -- people wear them just to say they own a pair. It's not so personal anymore. So instead I slipped on these clogs from Anthropologie that I can't stop wearing because they make my feminine side overly excited and I still somehow feel myself in them, heels and all. Then to add my last personal touch, I tied a neck scarf around my wrist, just like I did here, because I hate traditional bracelets but I do love this homemade one. I've been pro minimalism for the past two months, but I decided that maximalism is better, at least in this situation, even though it's over 80 degrees. In this outfit, I felt like a confident superwoman who was ready to take on the world. And that's what personal style should be doing. Do you understand why it's so important now? Full outfit pictures shot by me, detail picture shot by Kendall. View details about the Bloglovin' x H&M awards here.